Arrg. I wanted to like this audiobook, I really did. Hell, I even requested it from the library weeks before it came out and grabbed it the day the library called me. But I just can't get into it. Maybe it's the subject - she's preaching to the choir, here - or maybe it's that I know she's much funnier than this. Or maybe, just maybe, she's not a good narrator. Perhaps I'd be more into this if I was reading it and not letting Jen read to me. I think the cadence is off ... It seems like I've been listening to the same long story for hours now. ETA: Done. It continues on in the same vein. Instead of getting her point across, Kirkman sounds preachy and whiny. Instead of being funny, Kirkman is repetitive and frustrating. 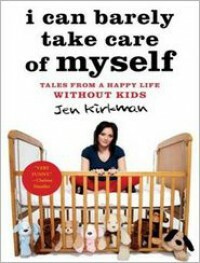 In the same way that her book turned me into a Sarah Silverman fan, Kirkman's book is very close to turning me into a Jen Kirkman former fan.